One of our lovely clients said to us recently, “printed compliment slips, they’re really old fashioned nowadays aren’t they?” and we agreed with them. But we didn’t want to say goodbye to printing compliment slips forever – oh no! Instead, we adorned our creative hats and hey presto! Ok, so notelets aren’t such a new thing but the way you present your company’s compliment slip could be. They can be used as a great way to send a personal note of thanks or recognition, to a colleague, friend or client. They are a tangible marketing tool making any content even more credible. “Technology has actually made the handwritten note somewhat of a lost art, allowing it to leave an even larger impact today than it would have in years past, especially from a business” source: Shopify. In our example, we’ve printed them double sided to promote our branding and we’ve included some practical, faint, grey writing lines to encourage a sentence or two. They’ve proven to be a great way of making notes in front of a customer – by being able to take the information straight away, it saves you time typing a follow up email. Avoid overcomplicating compliment slips, leave plenty of space for the message to get through. Include your website at the very least, which should have all your contact details on. We’ve included our telephone and email for ease of contact, plus our address because it provides gravitas. The Essential Print Services’ compliment slips are printed onto 170g uncoated heavy paper, but they can be printed onto a variety of paper and cards weights, depending on how you’re going to use them. For more of a correspondence card, then we’d suggest printing onto a 350g weight board. For something that will be used a notepaper, then 120g-170g would be ideal. 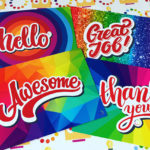 If you like the idea of using printed compliment slips, correspondence cards or notelets for your business or home life, give the Print Angels a call on 01332 418377 to chat through the most cost effective options and quantities.